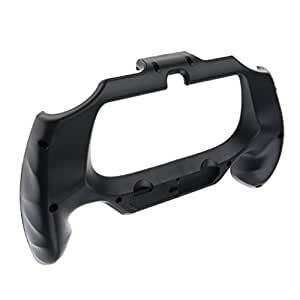 Trigger Hand Grip Handle Holder Joypad Stand Cover Case Protector Gamepad Hand Grip Bracket Joystick Handgrip for Sony PSV 2000. One click livelock button design ：Fine workmanship, light weight, close to the fuselage. Hollowing out backup：The operating space reserved for PSV touch board, not affecting the user playing games. The camera has a precise hole position, not blocking the hole to hang a doll or ornament. Ergonomically design：The arc handle matched with the palm provides you with wonderful hand feel. High quality：Made from ABS plastic, matte touch, anti dropping, anti-skid, anti perspiration function. - Trigger Hand Grip Handle Holder Joypad Stand Cover Case Protector Gamepad Hand Grip Bracket Joystick Handgrip for Sony PSV 2000. - One click livelock button design ：Fine workmanship, light weight, close to the fuselage. - Hollowing out backup：The operating space reserved for PSV touch board, not affecting the user playing games. The camera has a precise hole position, not blocking the hole to hang a doll or ornament. - Ergonomically design：The arc handle matched with the palm provides you with wonderful hand feel. - High quality：Made from ABS plastic, matte touch, anti dropping, anti-skid, anti perspiration function.